One common theme for almost every Patriots team throughout the Belichick and Brady regime is the heavy use of running backs in the passing game. 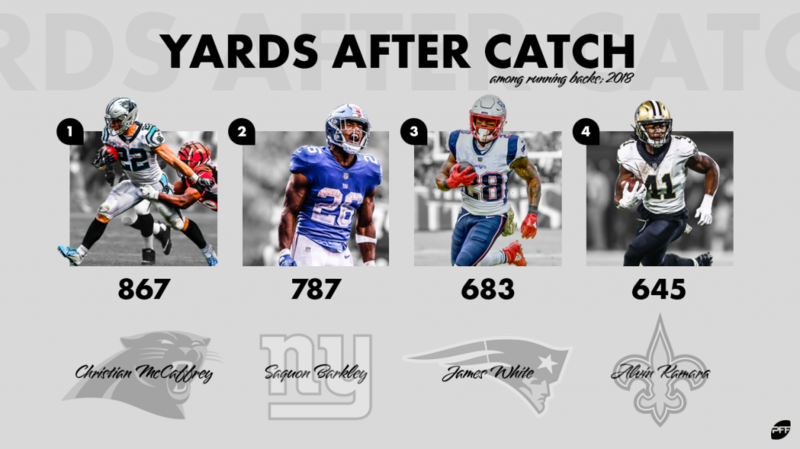 From the early 2000s with Kevin Faulk to the early 2010s with Danny Woodhead, and from the mid-2010s with Shane Vereen to the recent years with James White, the role of the pass-catching back in the Patriots’ offense is an extremely important one. This season has been no different, and last week’s annihilation of the Los Angeles Chargers was the epitome of how the Patriots rely on their running backs in the passing game. James White was targeted a whopping 17 times against the Chargers, which was six more than Julian Edelman’s 11 and three more than all the other Patriots’ pass-catchers combined. Of White’s 17 targets, he caught 15 balls for 97 yards and five first downs. The Chargers’ heavy use of cover-3 also helped influence the Patriots’ strategy of passing to White. White lined up as a running back on 15 of his targets, and 10 of those targets came when the Chargers were sitting in their cover-3 shell. By design, the cover-3 can be attacked in the flats, and part of the Patriots’ brilliance over the years is their willingness to take what the defense gives them. If we go back to the Patriots win over the Seahawks in Super Bowl 49, running back Shane Vereen led the team in targets (12) against the Legion of Boom’s legendary cover-3 scheme. This illustrates how the Patriots have no problem methodically dumping the ball to their running backs to keep the chains moving against defenses that will allow it. That makes the receiving back role vitally important in the Patriots’ offense. In fact, the Patriots are one of only four teams to have a running back rank in their top two in catches for first downs. White’s 43 catches for first downs this season (including playoffs) trails only Julian Edelman (49) among Patriots pass-catchers. What makes the Patriots’ passing game even better is that White has more than fulfilled the receiving back role – he has excelled in it. He accumulated 683 yards after the catch in the regular season, which is the third-most among running backs, trailing only Christian McCaffrey and Saquon Barkley. White gained a total of 751 yards through the air on 408 routes, which gives him a yards per route run mark of 1.84, ranking seventh out of 53 running backs. James White’s most effective route out of the backfield this season has been the simple flare route. To illustrate White’s ability to take dump-offs and turn them into something, he averaged of 8.8 yards per reception on flare routes in the regular season, which ranks second among running backs, trailing only Melvin Gordon. White was also effective in the screen game, gaining 162 yards on 18 screen receptions. White’s average of nine yards per reception on screens ranks third among running backs with at least 15 catches on screens. The combination of White’s skills as a receiver and the Patriots’ willingness to use their backs in the passing game have created a monster. The last time the Patriots won a Super Bowl, James White led the team in targets (15), and he gained 110 receiving yards and scored the game-winning touchdown in the miraculous comeback against the Falcons. New England’s offense is as dynamic as they come, and they can attack you in many different ways. But the moral of the story is that if either the Chiefs, Rams or Saints play soft coverage underneath, James White will be more than happy to take advantage and possibly win another Super Bowl while he does it.